FC Thunder is delighted to welcome Alexandra Gill as our latest addition to the coaching staff! Alex joins the club as an Academy Coach and has a coordinator role within the Recreational Program. “This is a great day for FC Thunder in being able to hire such a talented individual to the staff. Alex has demonstrated an exceptional work ethic and dedication to development as a coach and coordinator in her previous employment, just as she did as a team captain on the field as a player. 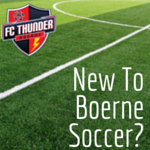 We look forward to everything Alex brings to the program.” – FC Thunder Director of Coaching, Wayne Bartlett. After growing up in Tomball, Texas, Alex has spent the last 5 years in the hill country. In 2017, Alex graduated with honors from Schreiner University where she spent three and a half years as a student athlete attaining a Sports Management degree and playing soccer. Alex was the team captain of the Schreiner University Women’s Soccer team for 3 years, a two-time 2nd team all-conference winner and a 1st team all-conference winner at the center mid position, in addition to academic all-conference member for 3 seasons. This past year Alex held the role of Sports and Recreation Coordinator at The Salvation Army Kroc Center in Kerrville, where she gained experience organizing youth and adult sports leagues, summer camps and tournaments, while coaching various youth sports as well as soccer, with players ranging from the ages of 3 to 15.